News: Taylor hails Davies as one of the "greatest ever"
Colin Meads is not impressed easily, and he knows a bit about life at the rugby coalface, so, of all the tributes that have been handed out in the past few days to my old pal Mervyn Davies, his was perhaps the most special. He realised that Merv was the glue that held the 1971 British & Irish Lions pack together and it was particularly fitting that he likened his contribution to that of Brian Lochore, the great All Blacks No. 8 and captain who led them to so many great triumphs in the 1960s. After going head-to-head against him on Wales' tour to New Zealand in 1969 - we were hammered even though we went there as unbeaten Five Nations champions - Merv realised Lochore was the man he had to judge himself against, so Meads' words would have meant a lot. I have particular reason to be grateful to Merv. The press vultures, and half the 'Big Five' (the Welsh selectors), were already starting to circle by the end of 1968. They were ready to write me off as being too small, whatever my other attributes, when he came along and allowed Wales the luxury of a ball-playing openside. Suddenly, we had stacks of line-out ball and a stability that had been missing at the base of the scrum since Alun Pask had retired, so the pressure was off. We were even able to go the whole hog and play Dai Morris on the blindside. It was only last year, when they got the three of us back together at a dinner in Wales, that Dai admitted he never topped the scales at more than 13 stones whatever it said in the programme. Merv really was a giant in every way, a genuine six feet five at a time when many second-rows were under six feet four, with a natural athleticism (he had played a lot of basketball at school and college) and a telescopic reach to match. He quickly went from being a string bean to a powerful 16 stones plus. The story about his meteoric rise from junior rugby to international player has already been told, but as soon as he joined London Welsh (the Taffia soon fixed a job at Emanuel School) we became very close friends, sharing rented apartments and houses in various places in west London until he returned to Swansea at the end of 1972 to get married. I was mortified. On our return from the 1971 tour (we had given up our rented house to save paying rent for four months) he had secured a flat in Wimbledon village owned by Emanuel School. It was very plush by our standards and we even had a spare room - but best of all it was hugely subsidised so we were paying just £11 each a month. I pleaded (was he absolutely sure he was ready for marriage?) but to no avail - little did I know that Swansea had gone one better and had made it possible for him to buy a house. Life seemed great - he cemented his reputation by again playing a dominant role on the 1974 Lions tour before taking over from Gareth Edwards as Welsh captain in 1975. 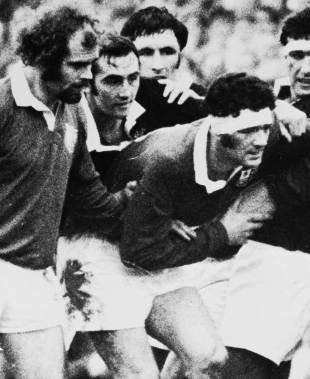 When he led Wales to a Grand Slam in 1976, most people already had him inked-in as captain of the 1977 Lions, but then his career was cruelly cut short when he suffered a brain haemorrhage whilst playing for Swansea in a Cup semi-final against Pontypool. "The sense of humour was as sharp as ever and woe betide anybody who became too big for their boots, particularly if they played in the backs." He was so fortunate that it happened at Cardiff Arms Park. Anywhere else and he would never have survived because medical facilities at most grounds were pretty primitive. Even so it was touch and go for several days, but eventually he recovered and I guess we should be grateful we had him with us for another 36 years. He was left with numerous health problems but, typically, was grateful to be alive ("It could happen to you tomorrow, but they've checked everything and it won't happen again to me," was one of his favourite lines) and soon adjusted to a life without sport. The sense of humour was as sharp as ever and woe betide anybody who became too big for their boots, particularly if they played in the backs. A strong believer that rugby players were divided into two camps - the piano-playing backs (who think they are indispensable) and the piano-moving forwards (who are really the heroes because backs cannot show-off without the ball) - he never lost an opportunity to ram the message home. It was one of the things he spoke of when I saw him last week - he was delighted that the current crop of Welsh forwards are grabbing some of the glory. "Keep up the battle," was one of the last things he said. Sadly, this was one battle he could not win, and we'll all miss him terribly. He was more than a dear friend. I really do feel as if I have lost a brother.